Alex loves Christmas. She owns a cafe by Sydney's harbour bridge, and she spends days decorating it with vintage hand-cut snowflakes to look like a winter wonderland - a magical retreat from the baking Australian summer outside. This year has not been easy - she was dumped by the man she thought she'd marry - but Alex is pouring all her energies into creating the perfect Christmas for her customers. 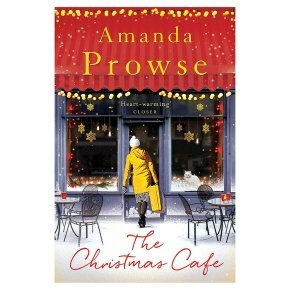 Until she starts receiving letters from a cafe in Bristol, England, and finds herself drawn to its mysterious owner...""
Alex loves Christmas. She owns a cafe by Sydney's harbour bridge, and she spends days decorating it with vintage hand-cut snowflakes to look like a winter wonderland - a magical retreat from the baking Australian summer outside. This year has not been easy - she was dumped by the man she thought she'd marry - but Alex is pouring all her energies into creating the perfect Christmas for her customers. Until she starts receiving letters from a cafe in Bristol, England, and finds herself drawn to its mysterious owner..."